We’re allowed to change our minds, right? I hope we are, because today I am changing mine! Nine months ago when I first started blogging, I posted a recipe for “Viva Mexico Guacamole”, thinking it was my best guacamole recipe. Well, today I am going to tell you that this is my best guacamole recipe! (Not that the other one is bad at all – I still love it.) I hadn’t made this recipe for awhile, but I made it last weekend for a little dinner party and I was overjoyed with it! The papaya and jalapeño and cumin push it to the outer limits! If I do say so myself, it is wonderful!! It is just so fresh and exciting, my guests gobbled up the whole bowl in no time flat! Tonight I am bringing a giant bowl of Caribbean Guacamole to my very favourite blog party –Fiesta Friday! Our host Angie at The Novice Gardener is the hostess with the most-est! You really must join us and check it out. I promise you, you will never go back! We feast and drink and laugh and carry on and there is no other blog party out there that equals it! Come and see! This recipe comes from my favourite Caribbean cookbook: The Sugar Mill Caribbean Cookbook, by Jinx and Jefferson Morgan. Simply mix all ingredients gently together in a big bowl. Check and adjust seasoning, and serve with your favourite tortilla or vegetable chips and a frosty cold Margarita! Jump for joy! Hi Glenda, Thanks so much for re-blogging my recipe! This looks WAYYYY too good and what’s better at a Fiesta than Guac?! I want to eat it alllll….. thanks so much for sharing, I can’t wait to try it. 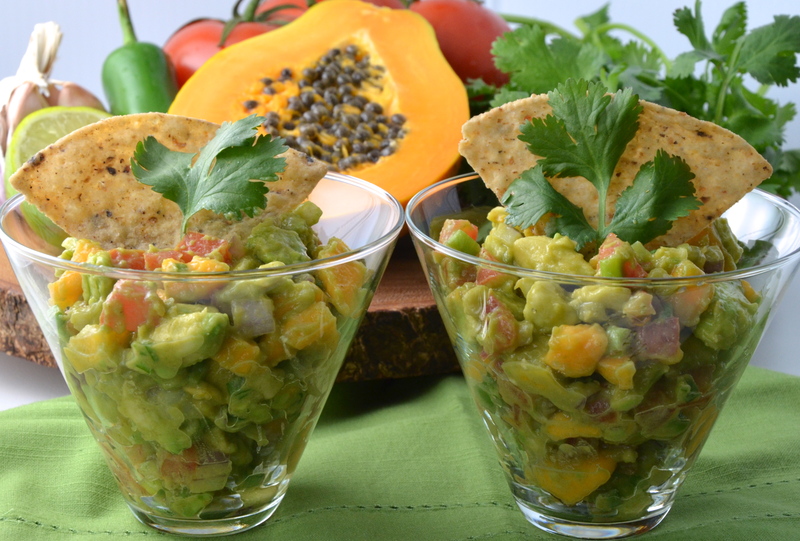 I love making guacamole… it wil be really nice to mix it up a bit, Carribean style! Avocados and papaya??? That’s really great! just one question is a regular papaya or the green one? No, I just used a regular papaya. It gives it just the right amount of sweetness! This sounds so good and summery!!! Hi Mimi! Yes, this recipe is the epitome of summer! You could also substitute a mango for the papaya, but I find it a bit too sweet. So beautiful – guac is elevated! I like that, perhaps I should change the title to “Elevated Guac”! Papaya in guacamole!? What an excellent idea!! Lol…I love it…”changing your mind”! I do that all the time, Julianna. I think if this guacamole tastes as good it looks, I don’t blame you at all! The ingredients sound delicious and those photos…Mmmm…my chips are ready! Well, just sidle on over to the table and dig in, Nancy! I hope you like it!! “Oooh fancy” was my 1st response! “Delicious” was my 2nd! Hot, spicy, sweet, sour- all in one Guac this is Jullianna! 😀 You 2 are the king and queen of hot, spicy, sweet and sour!! yumm….great photo too! happy weekend Julianna. What an interesting guacamole :). Thanks Sonal…I’m so glad it isn’t banal, not that Guac could be banal! Thanks Elaine! I hope you have a wonderful weekend too! Now all I need is a rum punch of some kind and I’ll be set. I love all the fresh flavors mingling in your guacamole. Mmmm… rum punch! Let’s get to the bar and see if that’s on the menu tonight! … Isn’t that life… that our best just keeps getting better, as we explore, have disasters, learn and discover! Thanks for passing on the VERY best guacamole recipe – I love avocados so am looking forward to trying it! Love this, it’s a great change from your regular guacamole recipe. Next time I make it I’m using this recipe. It really is a nice change! Hope you like it! I LOVE guacamole! And I would definitely be up for trying yours Julianna! And I love the set up and pictures! Great job! Light, healthy and refreshing recipe! I love papaya and this recipe sounds wonderful!!! Ah yes, this is one of the things I love about Guac! It is actually really healthy! Yum, Julianna! You may have come up with a way for me to enjoy papaya. Why didn’t I think of this? Papaya is super healthy, isn’t it? Yet I alway shy away from it. I’ll give this a try, I do trust your recipes. Btw, I think I’m going to run out of co-host volunteers soon, maybe in 2-3 FFs. I may have to dip into previous co-host pool. Let me know if you’re interested. Sure, I will be a co-host again….that rowdy bunch of fiesta-ers can’t scare me away 😀 Give me a date in June, as May is turning into a crazy month for me, what is left of it. Just let me know. Sounds delicious! Love how you added papaya. I like the way you are serving it too! sounds really nice and thanks for sharing the cookbook title too, always a pleasure to discover new books! Your Guacamole look so tempting and so inviting 🙂 I can hear the steel drums too, Julianna! Wha Hoo! And I am dancing up a storm over here! Love that Caribbean beat! This looks lovely! 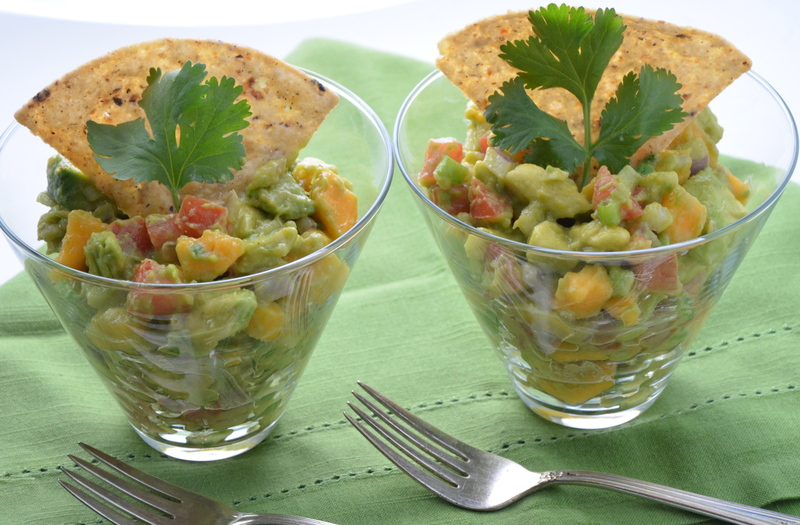 Your photographs are great too – they really capture the freshness of this guacamole. Glad you like the pics, Georgina! 😀 I have a lot of fun doing them….sometimes more than making the dish itself! Excellent combination of ingredients Julianna. I love anything sweet, sour and hot. Thumbs up! Thanks Sadia! And you can really pump up the heat in this one because the papaya balances it with the sweetness! I love guac! I’ll have to try this! A girl always has the right to change her mind! I am the big (THE BIG) fan of guacamole. My sister-in-law has her’s coined by my Mom as “irma’s guacamole”, which is exquisite (but she has had practice coming from Oaxaca, Mexico). Anything with avocado and papaya has to be good. Thanks for bringing this to the Fiesta! Nice combo and so pretty! I can see this as a summery topping for grilled fish too. I’d only swap in mango since papaya for some unknown reason makes me think of corpse meat. Yeah, I dunno, don’t even ask. And no, I’ve never eaten corpse meat (in case you were wondering). Anyway it’s gorgeous, thanks for sharing! LOL! I told you not to ask!!! I don’t know, it’s like it tastes and smells like dead human flesh to me but I SWEAR I don’t really know what that tastes like. Ack. I’ll never be invited to this party again. I hope you got a chance to try some Jhuls! It disappeared really fast! My pleasure! Looks like I should have made a bigger batch!! Looks delish! Thanks for sharing. 🙂 I looove avocado. Awesome! I think many people love this beautiful fruit! Gorgeous guacamole – so elegantly presented! Hey Julianna! Hope your week has started out good! Just want to let you know that I have my writing process blog tour post up now. Looking forward to reading yours next week! I am so glad you are doing this with me! Yay! Guacamole is a favorite of mine and I can see why your version was a hit! Delicious! 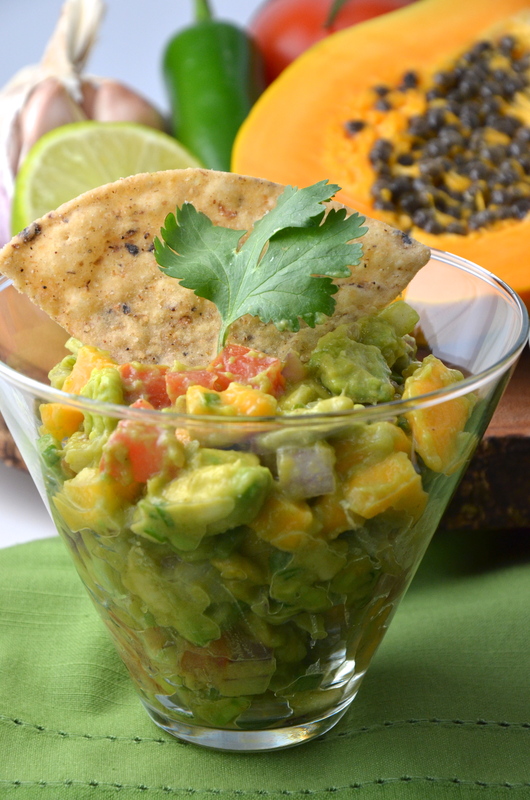 I usually love traditional guacamole, but this one sounds so interesting and flavorful! It’s so cute how you served it in the individual glasses with the chip on top. It is such a beautiful presentation. Thanks so much for sharing this unique recipe! Thanks so much, Shari! I love traditional Guac too, but this is a beautiful change! I’ve just been thinking of guacamole. I love that stuff. I see the carribean version has some papaya in it. Papaya is great for digestion!